I first fell in love with poetry, years before I fell in love with the nursing profession. My love affair with books and novels started when I was in grade school. I could never forget the very first book (a gift from my aunt, Sister Mary Ignatius, SPC) that I read: The Holy Bible. Then, every month, I look forward to receive the issues of The Reader’s Digest. During that time, because of my limited understanding of the English vocabulary, much more, the old vocabulary of the Bible, I always had a dictionary beside me. 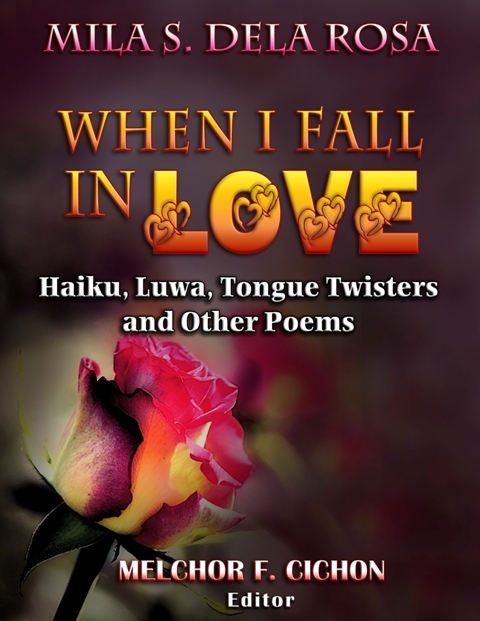 All through the years, my love affair intensified, and the desire to write poetry blossomed during my high school years. Young as I was, without a formal introduction and education on how to compose a poem, I just sat down with a paper and a pencil, and wrote what I felt, using simple words that came to my mind, creating and playing with language. Believe me, it was a struggle to gather thoughts, ideas, and feelings, then laid them out into structured verse(s). Much more, too many papers had been crumpled and pencils sharpened. It was frustrating! I felt this over and over, up to the point of telling myself: “Maybe you are not good enough to be a poet. Maybe, not this time, maybe later”. But instead of giving up, I embraced the challenge. As one poet said: “Great poets don’t think in terms of a destination. It is always a journey”. This served as a driving force for me to try, and try, and try. Of course, I did not envision myself to be a great poet, but at least, just to learn the trade of poetry writing. Just as any love affair, mine cooled down when I went to nursing school; then, when I practiced my profession; then, when I embraced a family life. But all those times that I focused on, and prioritized my professional growth and advancement, a portion of my heart was still being occupied by poetry, that, at any time, place, or opportunity, my desire to write poetry rekindled. Several years ago, with the advent of technology, I stumbled into a website while surfing the internet: the http://my.akeanon.com. Through this website, I came to know a brilliant man, whose knowledge in poetry and creative writing could not be questioned. He is the Aklanon Neruda or Rumi, but with a distinct touch of uniqueness that is simply his own. Mr. Melchor F. Cichon has his own way of bringing out the best in every person he mentors. He challenged me, inspired me, educated me, and never gave up on me, that my first love: Poetry, resurfaced after so many years of being in hibernation. After all, there is a saying: “First Love Never Dies”. This is true, as mine didn’t.